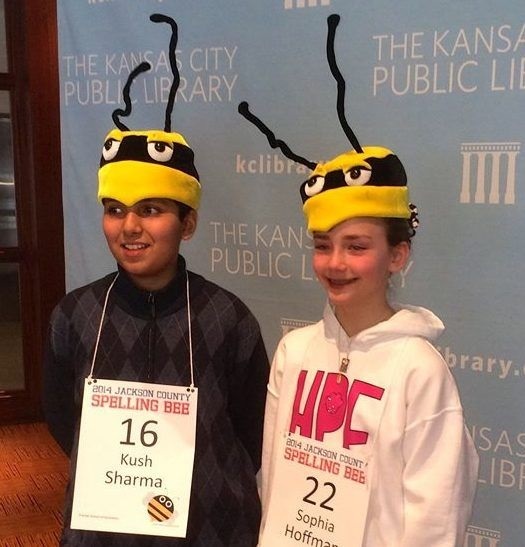 A week ago in Jackson County, Missouri, an epic spelling bee battle between fifth-grader Sophia Hoffman and seventh-grader Kush Sharma finally came to an end. In the first part of the match—which was only meant to have one part—the two went sixty-six rounds, exhausting all of the words that the organizers had prepared for the spelldown. In the second part of the competition, held two weeks later, they went almost thirty rounds before Sophia Hoffman stumbled on “stifling.” Kush Sharma then defeated “definition” (after asking for its definition, of course!) to win the match. As for some of the words they had to spell in between . . . well, let’s just say that spelling bees were about the only teams I was picked first for when I was in grade school, and I’m glad I didn’t have to spell those words! Of course, the win was very exciting for Sharma, who will now go on to compete in the Scripps National Spelling Bee. It was also very disappointing for Hoffman, who got so close, only to fall short after so many rounds. Her father was philosophical for her: “I think it is part of the growth of the kids to learn how to work through disappointment and come out stronger,” he said, as reported in an AP story. The two middle schoolers had become friends during the long matchup, so even for Sharma, the victory was bittersweet. After he won, he was quick to show Hoffman support and appreciation. Now that’s grace in victory! And it shows a wisdom beyond his years. For Sharma, the opponent is not the other person. It’s the challenge and the task we’re up against. Who or what are we fighting? The human mind is a funny thing. “Stifling” is a relatively easy word to spell compared to some of the other words that were on the list. But for whatever reason, Hoffman tripped over it. Once she misspelled it, all Sharma had to do was spell the next word correctly, and he would win. As soon as the also relatively easy word “definition” came up next, before Sharma had even spelled it, everyone knew that the match was as good as over. It was the words, and perhaps her own mind, that beat Sophia Hoffman. Yet if we look at Kush Sharma’s words more deeply, we find a hidden truth there. Whatever battles we may face in life, it is never really the other people that we’re fighting against. Even if we’re pointing swords or guns at each other, our opponent is not the human being facing us. It’s the words. The ideas. The desires. The faults and limitations of the human mind and heart. These are our real opponents. The human beings on the other side of the battle are only their stand-ins and representatives. And in our own life, whether we’re struggling for food and clothing or struggling for a promotion or struggling for justice, it’s never really other people that we’re fighting against. We’re fighting against the ways of the world, against economic and biological limitations, against the faulty ideas of the human mind and the misguided cravings of the human heart. We’re fighting against our own fears and limitations. These, and not the people confronting us, are our true enemies. Whenever you think you’re fighting against people, look deeper. Jesus tells us to love our enemies (Matthew 5:43–48; Luke 6:27–36) because we are not to have human enemies. It is not the person, but the evil that we are to fight against. And we can love the person even while fighting against any falsities that they spread and any evils that they perpetrate. Most of all, our enemy is the faulty thinking and mistaken desires within our own minds and hearts. Just as Sophia Hoffman was beaten by the error of her own mind in misspelling “stifling,” so we are beaten by our own errors of mind and heart. When we recognize the wrongs within ourselves, and fight the battles that we face within our own soul, we will have plenty of work to do without needing to point out the faults of others, or see them as our enemies. In fact, when we refuse to battle our own inner faults and shortcomings, that is precisely when we find ourselves facing endless external enemies that we can never overcome. But that’s a subject for a future article. For now, if we find ourselves in a battle, we’ll do well to keep in mind the wisdom of seventh-grade spelling bee champion Kush Sharma. It’s not a question of “I beat her” or “she beats me.” It’s the words that beat us. And the lesson of the words can heal us as well, when we take them to heart. I sometimes struggle to keep this in mind, but it’s such a calming idea. I find that I occasionally face battles in teaching – I’m thinking mainly of student plagiarism – and I try very hard to isolate my approach to the issue from my approach to the person. Or as Jsmooth puts it, I try to change the conversation from “what they are” to “what they did”. Yes, it’s quite a challenge to distinguish the person from the words and actions. But it’s worth the effort. People who are on the wrong track tend to identify with their damaging words and actions, thus clutching those destructive things closer to themselves and making them part of their identity. In a sense, part of our job as teachers and leaders is to drive a wedge between the person and the destructive words and actions that they are claiming as part of themselves. Of course, ultimately it’s their choice who they will be, and what they will claim as their identity. But we can still reach for and shine a light on what could be a better identity for them. Perhaps they don’t even believe that they can be better than this. We can give them the message, “Yes, you can be better than that.” Then they’ll have another believable choice besides the downward one.